Men's black motorcycle protective hoodie fully lined with 330gsm knitted Dupont™ KEVLAR® & removable CE armour at shoulders, elbows & spine. The outershell is constructed from premium black cotton inner fleece providing a comfortable breathable casual jacket, perfect for those rides around the city / town. Wearing a Finn Moto motorcycle hoodie you no longer have to lug around a heavy bulky stand out motorcycle jacket. Ride in full confidence knowing you have Kevlar lining throughout the whole hoodie with extra layers in the shoulders & elbows. The jackets longer torso ensures maximum coverage for all riding positions. Finn Moto's motorcycle hoodies combine a unique blend of premium materials & armour which is carefully constructed into our New perfect fitting casual protective jacket. The fabric is treated with a long lasting New Water-Repellent finish. Finn Moto's unique combination of impact & abrasion resistance along with its weatherproof properties gives our motorcycle riders the confidence & convenience they need on & off the motorbike. The new weatherproof cotton shell is treated with Bionic-Finish which is Water, Oil & Soil Repellent allowing you to ride in light rain without the jacket being soaked through (dries rapidly). The treatment is bluesign approved (eco friendly/safe). Extended products life with UV protection keeping the jackets colours & fabrics looking new. The cleaning properties of Bionic-Finish is designed specifically for clothes allowing bends/folds where as nano technology requires a firm flat surface; (The water beads off like it does on a lotus leaf). Free P&H Australia-wide for purchases over $100. Finn Moto's protective hoodie was originally designed in 2009; with the support of riders all around the world it has gone through countless refinements; improving with each new batch that arrives. Its safe to say this motorcycle jacket has well & truly been perfected; see our customer reviews above. 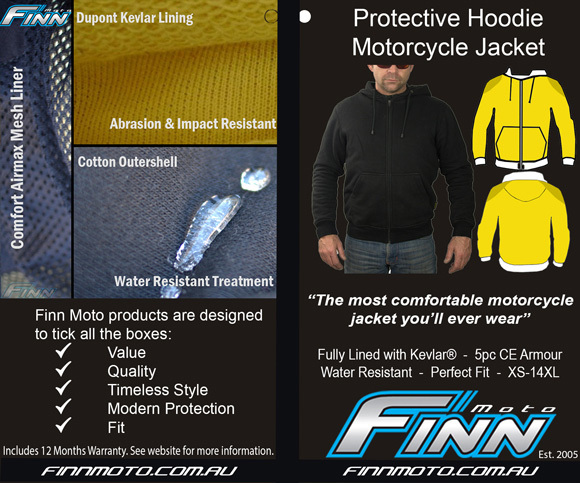 Finn Moto takes pride in offering our customers motorcycle clothing with premium materials, independent protection rating, perfect fits & a 60 day money back/exchange guarantee. If your still in research mode be sure to read our Kevlar Jeans Buying Guide for more insight into our protective clothing. * New Removable CE Level 2 Approved armour shoulders elbows spine for impact protection. Memory foam extremely comfortable hardens on impact. * True Sizing - Please double check your size by checking the size chart guide. 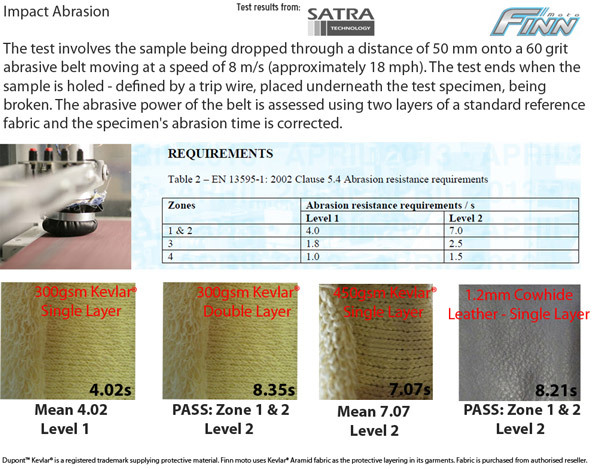 Finnmoto's knitted protective layer of Dupont™ Kevlar® aramid fibre has been independently abrasion tested; passing level 2 in impact areas & level 1 in single layer areas for 13595-1: 2002 5.4 abrasion protection from Satra Technologies UK. Fitting for XS to XL, if your Tshirt size is Large. Your chest should measure 42inch. Fitting for 2xl or higher, please measure your chest and match it up. If your stomach is equal or larger than your chest measurement its best to go up one size. If you have an avg to large build and tall, its best to go up one size for length & broadness. I got these online with the 500g Jeans and Both are great quality and fits great. After I ordered both products I had an unexpected phone call to confirm my size as the sizes I ordered usually don't go together. They were right, I changed my order to the size they recommended and when they arrived, they fit perfectly. The service was excellent, they know the product and are very easy to deal with. Delivery was very fast. haven't had an opportunity to fall off my bike and test the product thoroughly yet but it is very comfortable, warm & I look pretty awesome in it. Great value for money. Competes easily with more expensive products. Thanks. Had this Hoodie a while now and have done quite a few distance rides in it. Its really comfortable and the fit is spot on. The quality is the usual Finnmoto standard which, as expected, speaks for itself. Highly recommended. Absolutely brilliant hoodie. I ordered a 7XL and it fits great. I live in QLD and even when it was hot the hoodie never felt like it was unbearable. Great airflow when your moving and the elastic waist band keeps it in place. My only criticism is the front pockets, if they had zips to keep items more secure this would be a 5 star rating. But that is a personal issue and not everyone will care about that. Bonus points to Finn Moto for calling me to make sure that the 7XL was the hoodie I was after and to confirm my measurements to make sure it would be the right fit. 10/10 service from these guys and I will purchase from them again in the future. Looks like your average hoodie... this is anything but that. Very comfortable fit and the sizing chart worked perfectly for me. Thick arm and waistband cuffs that hold this hoodie in place. Solid construction throughout, elbow, shoulder and back armour stay where they should, makes me feel very good about wearing this as my main form of protection. I’ve not worn this in cold weather but I think a long sleeve layer underneath will get me through most of what Sydney can throw at me. Hoodie was delivered within 2 days and the fit was perfect. This is not a thin and cheap hoodie, the quality and fit is excellent. So far I have worn it in the evenings at 15C and a 100km ride at 39C - no problems with just a tee undernear. I've got to get some of Matts jeans now. Even in cold Iceland its the best! I was a little nervous buying a motorcycle jacket online and gettimg it sent to Iceland of all places... But the service from Matt the owner gave me confidence. This guy is great at his job and I’m happy to say I wore it today in 3 deegres celsius today (with a thin wool shirt) underneath and it was enough! Great product, value and super service. Takk fyrir!!! My Hoodie arrived super fast, was a great fit making it comfortable to wear and the quality looks great. First class product and service. Very fast delivery. Already a repeat customer. Will be back again! Went in and saw Matt and he showed me the updated flexible armour he puts in which makes movement so much easier. Jumper is a great snug fit and I feel as protected as I do when I'm wearing my RST jacket. Have taken the armour out for shorter rides so it doesn't feel like I'm lugging around a bike jacket.